In 1985 whilst working at Santa Cruz guitar company, and with the help of Richard Hoover, I purchased a few boards of Brazilian Rosewood. 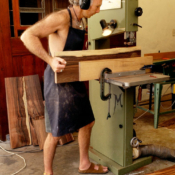 On my return to South Africa in 1986, I made my first guitars using this wood and I was hooked. 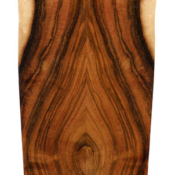 The beauty and tonal properties of Brazilian Rosewood is legendary. It does, I believe, make for better notational separation, volume…and has many other subtle nuances. There can be no denying its visual characteristics and as an investment it has huge collectable value. In 1987 I was approached by a wood company in South Africa to come and look at and to make an offer on 25 boards (4 meters x 50cm wide x 10cm deep) of Brazilian Rosewood. I had to sell many possessions to acquire this wood! Almost 30 years later and the pile is dwindling, I have managed to obtain a few other boards between then and now, but the reality is that all of us guitar makers worldwide are scratching to find decent Brazilian Rosewood. My struggle is to get a few good pieces from a big pile of timber, which begins by looking at a cube or more of Brazilian. From the outside it has the look of a treasure trove, but once one gets into it, it often is a horror story. Sometimes out of one beam I will only get one or two bookmatch sets for guitar backs. An enormous amount of hours are spent looking, processing and cutting. 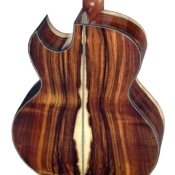 One of the reasons that Brazilian Rosewood timber guitars are the most expensive is because firstly the timber is literally unavailable worldwide, the forests having been denuded, and the available timber is a nightmare to process.